The Cesar Chávez Digital Mural Lab is Commissioned by Verizon For the Hispanic Heritage Mural Project in New York. The Design for the mural entitled “Dreaming from the Fire Escape: Sueños desde el Balcón” is an allegorical composition that combines elements of the students everyday reality in New York City as seen through their eyes via box camera photos of their neighborhood. The inspiration for the concept of the mural comes from a drawing by one of the students from PS 143 in which the New York landscape and the Dominican landscape are represented as two simultaneous realities in northern Manhattan separated by a palm tree. Pre-Columbian pictographs of their Taino antecedents, as well as mythological figures represented in the Carnival of the Dominican Republic and villages of their homeland are included as indicators of the origins of their rich culture. 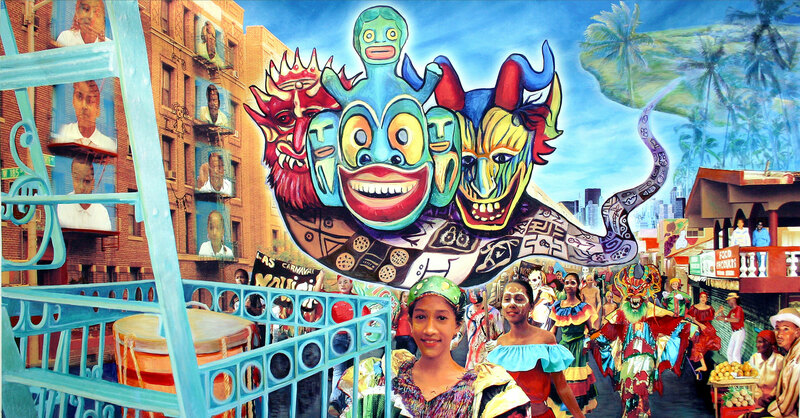 The narrative of the mural, one in which a young person witnesses a Carnival celebration from their balcony, sees their peers on firescapes of the adjacent buildings, and recalls the island they call home, weaving together a complex identity rooted in a cultural legacy dating back thousands of years.